Eleven years ago I attended my very first homeschool book fair. We had a just turned 4 year old boy, a 2 year old girl, and a 2 month old baby. Like many new homeschoolers, I was very enthusiastic about starting homeschooling, and I wanted to go ahead and have a “test” year to make sure that I could actually do it. Looking back, I see why so many people have the idea or making preschool a test year, but determining if you’re going to be able to homeschool using a 4 year old as a test subject is not particularly helpful. A lot of growth occurs between 4 and 5. And those younger kids that you’re worrying about keeping entertained grow a lot in a year too. Thankfully, we were cheap, poor, frugal so that took a lot of bright, shiny preschool programs out of consideration. That helped me by necessity to keep things simple. That one thing was Alpha-Phonics. Alpha-Phonics is a phonics-based reading program that has short lessons. It’s a very gentle approach to learning to read using time-proven methods of reading instruction. You teach the sounds the letters make, and you put them together to sound out words. There is repetition, but not long lists of rules to memorize. It doesn’t require writing, which is great for young learners since fine motor skills for writing often lag behind reading readiness. And it is very affordable. Eleven years ago, we taught David to read using Alpha-Phonics. He was only 4, but he was ready to learn. Anna was not ready to learn to read at 4, or at 5. She was almost 6 before she grasped the concept of blending sounds together to make words. And William was even older. Lizzie however, was another young reader. I didn’t even teach her to read. She learned from several different computer games and her older brother and sister. As a result, she is a little weak on sounding out words. So I’m going to be going through Alpha-Phonics with her to fill in the gaps. When Alpha-Phonics contacted me to see if I wanted to review their updated program, I couldn’t refuse. The main Alpha-Phonics text is unchanged from the version I purchased 11 years ago. But they’ve added some extras. In addition to the book, there is now a CD-ROM of the entire text included at the same low price. 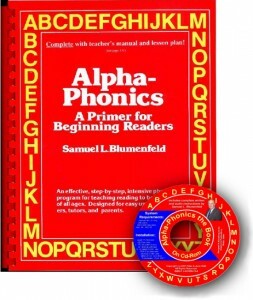 I’ve tried out the CD, and I liked listening to the author, Samuel L. Blumenfeld, discuss the development of the alphabet and phonics instruction. I think the CD has more value to someone who is using Alpha-Phonics in a classroom setting, but it might prove useful to be able to have the student read from the computer instead of the book just for the sake of variety. It’s not a computer game, it’s full screen images of every lesson in Alpha-Phonics, with teacher instructions, both written and recorded. I also received the Companion Workbook and the Little Companion Readers.The Companion Workbook has simple exercises to reinforce the concepts learned in the Alpha-Phonics book. The exercises require very little writing so they would be useful for a younger learner. There is a guide that correlates the lessons in the book with the workbook. The Little Companion Readers are also correlated with the Alpha-Phonics lessons. I have always found phonics readers helpful in those early stages of learning to read. Reading sentences helps with reading comprehension skills and proper voice inflection. It’s nice to have readers specifically linked to your phonics program so you know there are no surprises with letter sounds that haven’t yet been introduced. I highly recommend Alpha-Phonics for beginning or remedial phonics instruction. Disclosure: I received a free copy of Alpha-Phonics, the Companion Workbook and Little Companion Readers in order to write this review. I was not compensated for this post. All opinions expressed are my own. This post contains an affiliate link. We used Hooked on Phonics for the kids. We’ve used Frontline Phonics and Bob Books in the past. I’ve used Ordinary Parent’s Guide to Teaching Reading but by the time we get 2/3 of the way through it we all get bored stiff and so my oldest has really poor vowel combination identification skills. With my younger two I just recently found Now I’m Reading books which they love but again I’m stuck at that stage beyond CVC stage and am afraid all 3 of my kids are going to struggle beyond this beginning stage. We used the “I Can Read It” books (and accompanying learn-to-read program) from Sonlight for our oldest. Our second son taught himself to read – we were getting ready to start the same program when we discovered he was reading the subtitles on the TV faster than his brother! We’ve tried “Teach Your Child to Read in 100 Easy Lessons” and “The Ordinary Parent’s Guide to Teaching Reading” with our daughter, but neither one was a good fit for us. We’re trying now to just “make something up as we go along,” and it’s working a little, but we’d sure love to try Alpha-Phonics! I used Horizons, Teach you child to Read in 100 Easy Lessons, and Hooked on Phonics.